Ok, so you’ve listened to Dark Side of the Moon in a dark room, stoned out of your gords, taking an inward journey that defies space and time. You’ve even watched The Wall, the movie tribute to the late Syd Barrett, set to the epic concept album of the same name written by the great Roger Waters. You may have even gone so far as to start Dark Side of the Moon and The Wizard of Oz at the same time to see if they really do sync up. 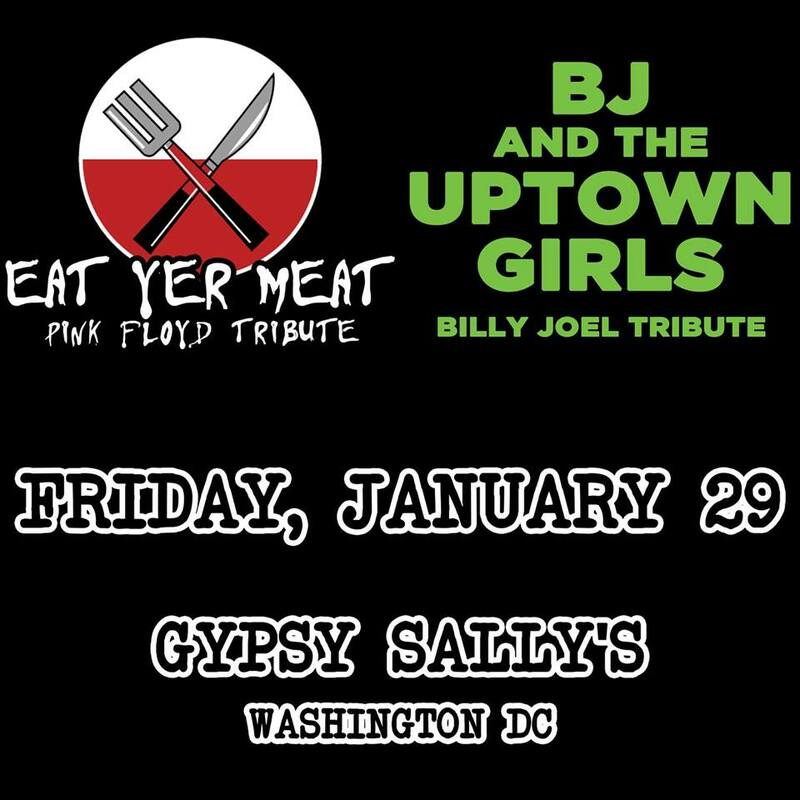 Eat Yer Meat, a live Pink Floyd tribute band, is made up of five members of various other regional bands, a supergroup combo from DC and Baltimore, and they are ready to bring you a Pink Floyd experience like none other at the one and only Gypsy Sally’s in Washington, DC! Joining them on stage is another tribute group, BJ & The Uptown Girls. Another supergroup of the Baltimore/DC area, BJ & The Uptown Girls pays tribute to one of the greatest songwriters in history, Billy Joel. If you are a fan of either Billy Joel or Pink Floyd or both, this will be an incredible evening of recognizable tunes played in a truly unique manner and setting. These are some of the best musicians in DC and Baltimore, and they’re ready to dig deep into two incredible catalogs. This one of a kind event will be held on January 29, 2016. This entry was posted in Gigs, Heady Entertainment, Just Announced and tagged Billy Joel, BJ & The Uptown Girls, Concert, DC, Eat Yer Meat, Gypsy Sally's, Live Music, Pink Floyd, Rage, Rock, Rock & Roll, Washington.